The H-2A visa program allows farmers anticipating shortages of U.S. seasonal workers to be certified by the U.S. Department of Labor (DOL) to recruit and employ foreign workers with temporary, nonimmigrant visas. DOL certified 165,700 jobs to be filled by H-2A workers in fiscal 2016, up 14 percent from 145,900 in fiscal 2015.1 The H-2A program in 2016 is two-and-a-half times larger than it was a decade ago in 2006, when 64,100 jobs were certified. Most crop workers are unauthorized, and farmers are turning to H-2A guestworkers as unauthorized migration from Mexico to the United States slows, to replace current workers who leave agriculture to find non-farm jobs. Most H-2A workers remain in the United States less than the usual maximum of 10 months a year (fewer than 10,000 stay in the United States up to three years to herd sheep under a special provision of the law). H-2A workers who were employed to work on crop farms in 2016 were certified to be in the United States for an average 167 days, or about seven months—working 24 days a month—weighted by the number of workers that employers requested for each certification. There are more H-2A-certified jobs than workers because some employers do not hire an H-2A worker after a job has been certified, and some guestworkers fill two or more jobs. 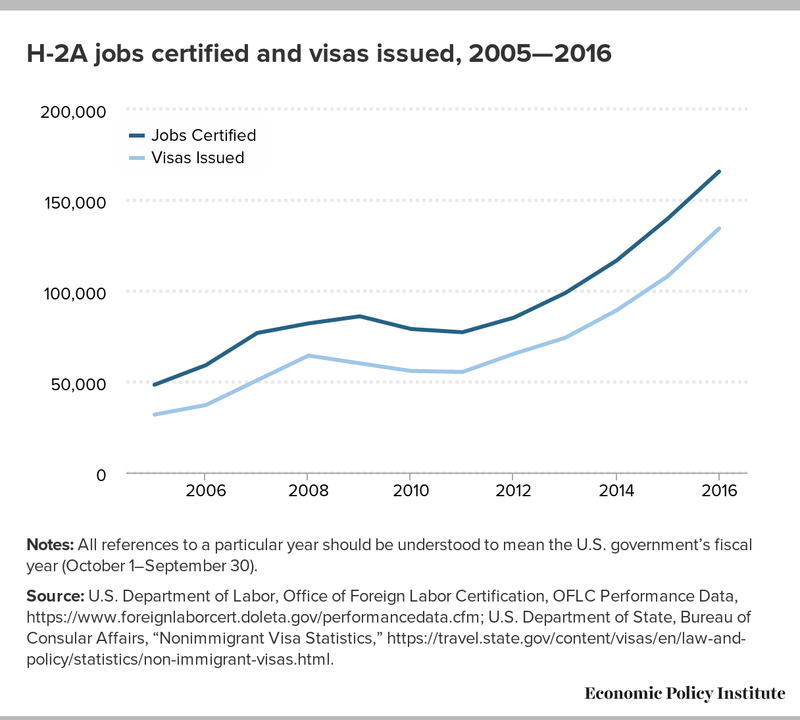 Each worker requires a visa, and the ratio of visas issued to jobs certified has been falling, which suggests that there are fewer H-2A workers filling several jobs. There were 1.6 jobs per worker in 2006, but only 1.2 in 2016. The H-2A program has grown fastest in two states. In California, the number of jobs certified rose from 2,600 in 2006 to over 11,000 in 2016, and in Washington from 3,000 to almost 14,000 over the same period. Based on grower requests so far in fiscal 2017, H-2A certifications could top 20,000 each in California and Washington, which could mean over 200,000 U.S. farm jobs being certified to be filled with H-2A workers. Over half of H-2A jobs in 2016 were certified in just five states. 36 percent of H-2A jobs certified in 2016 were in three southeastern states, Florida, North Carolina, and Georgia, followed by 15 percent in Washington and California. H-2A workers are also hired differently by state. In California, most H-2A workers are brought to farms by farm labor contractors (FLCs) such as Fresh Harvest, while in Washington most H-2A workers are brought to farms by an employer organization, the Washington Farm Labor Association (WAFLA). WAFLA is sometimes only a recruiter of H-2A workers, and other times acts as both the recruiter and the employer of H-2A workers while they’re in the United States. Florida is similar to California in having FLCs dominate the recruitment and employment of H-2A workers, while North Carolina is similar to Washington in having the North Carolina Growers Association bringing over half of the H-2A workers into the state. There are an average of 900,000 full-time equivalent (FTE) jobs on U.S. crop farms, including direct hires and crop support services such as contractors that bring workers to farms. The Department of State issued over 134,000 visas to H-2A workers in 2016—the highest number of H-2A visas ever. If we round the average duration of an H-2A worker’s job to an average of six months, the total H-2A workforce represents fully seven percent of the FTE crop workforce. 1. All references to years refer to the U.S. government’s fiscal year (October 1 to September 30) rather than the calendar year.